Food at a banquet was served at the table on large platters and guests helped themselves using a knife to cut off pieces of meat which they would have then eaten delicately with their fingers (forks were an Italian Renaissance idea that only became popular near the end of the 16th century). It was down to the way food was shared that a number of formal rules were developed that directed people on how they should behave at mealtimes. These were mainly concerned with being considerate to others and cleanliness, starting with the necessity to wash your hands before sitting down. If you were at the top table you would have washed your hands in a small bowl called a ewer which was brought to your table by a servant. Things considered bad manners at a banquet included putting old bones back on a shared plate, nose picking, ear scratching or blowing your nose – exactly the kinds of things that would be frowned upon today. Your behaviour at a banquet could and would be noticed so good table manners were vital if you wanted to succeed at the Tudor Court. The most magnificent banquets were of course the ones hosted by the royal family. Henry VIII in particular is famed for his elaborate banquets; displaying a powerful dynastic image was everything to the Tudors and a banquet was the perfect opportunity for Henry to show off, this was especially true if there was a foreign monarch or dignitary present. 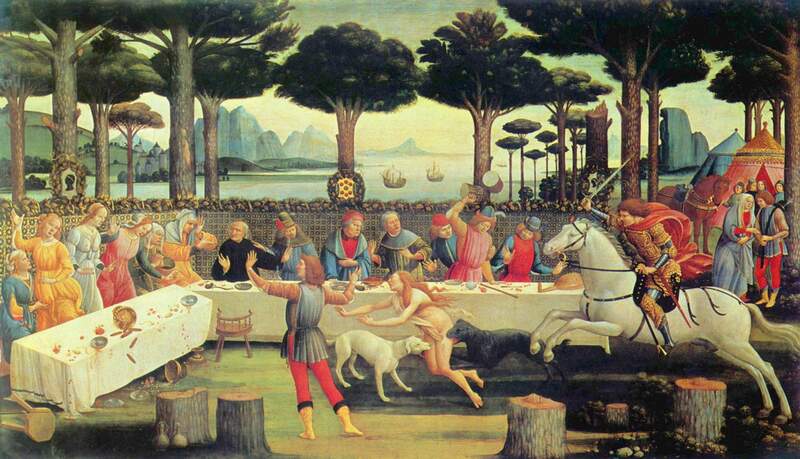 France led the way when it came to banqueting, a Tudor cook would have been only too aware of their high standards and would have tried hard to provide a banquet with a similar level of luxury and content. A royal banquet would often be accompanied by a fair amount of pomp and ceremony too, especially if it proceeded a great event like a coronation, marriage or christening. The excerpt below is from a contemporary account of the coronation of Henry VIII and Katherine of Aragon in 1509. It was written by the Tudor chronicler Edward Hall. You could expect a great number of dishes to be served at a banquet, sometimes up to six courses. These courses were not served in the same way as today with one course being served up after another, instead, all the food would have been laid out on the table at once. 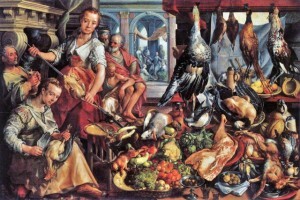 An abundance of food meant that everyone could get to eat the foods they particularly enjoyed, it also ensured there was enough food left over for the servants who ate later. There may also have been an elaborate centrepiece on the banquet table; perhaps to add a little theatrics or simply so the host could show off to his guests. A centrepiece might have been a pheasant or swan which had been “re-dressed” in its feathery skin so that it looked the same as it did in life, it may also have had it’s feet and beak gilded. There are also occasions where live birds like pigeons were added to pies so they flew out as the pie was cut; once the joke was over a real pie would then have been served to guests. The food served at a Tudor banquet was indeed sumptuous and would have focused very much around meat, which in Tudor times was cooked on a spit over an open fire. Who ate what was of course dictated by your status in society so the diners on the top table could be offered roast venison whereas those way down the pecking order, servants and the like, may have been given “umble pie” made from the internal organs of the same deer. As you might have guessed, this is also where we get our term “to eat humble pie” which means to know your place. As vegetables were considered a food for the poor they were not eaten much by the wealthier members of society. In fact it was a common misconception of the time that raw vegetables could actually make you ill – how times have changed! New foods and spices were also being discovered and imported during the Tudor period, such as nutmeg and sugar from the New World. These ingredients were hugely expensive luxuries and gave rise to a number of new and unusual recipes that the nobility used to further demonstrate their wealth and status. Sugar in particular became very popular with the wealthy classes during the middle ages. By the 16th century elaborate new ways of using sugar had been discovered so it could now be moulded into elaborate edible models which were sometimes used to create a striking centrepiece for the banquet. These models may have been created from marchpane, a Tudor version of marzipan, which was made from three main ingredients; almonds, sugar and rosewater. It wasn’t just the cost of the ingredients that made marchpane so expensive but also the amount of labour involved, the almonds needed to be shelled and finely ground and the sugar had to hacked off from a large crystallised rock and then pounded into a powder using a pestle and mortar. Satisfying a sweet tooth in Tudor times certainly required a lot of hard work! 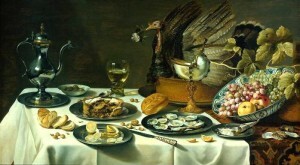 On the table was placed a centre-piece, which represented a green lawn, surrounded with large peacocks’ feathers and green branches, to which were tied violets and other sweet-smelling flowers. In the middle of this lawn a fortress was placed, covered with silver. This was hollow, and formed a sort of cage, in which several live birds were shut up, their tufts and feet being gilt. On its tower, which was gilt, three banners were placed, one bearing the arms of the count, the two others those of Mesdemoiselles de Châteaubrun and de Villequier, in whose honour the feast was given. The first course consisted of a civet of hare, a quarter of stag which had been a night in salt, a stuffed chicken, and a loin of veal. The two last dishes were covered with a German sauce, with gilt sugar-plums, and pomegranate seeds…. At each end, outside the green lawn, was an enormous pie, surmounted with smaller pies, which formed a crown. 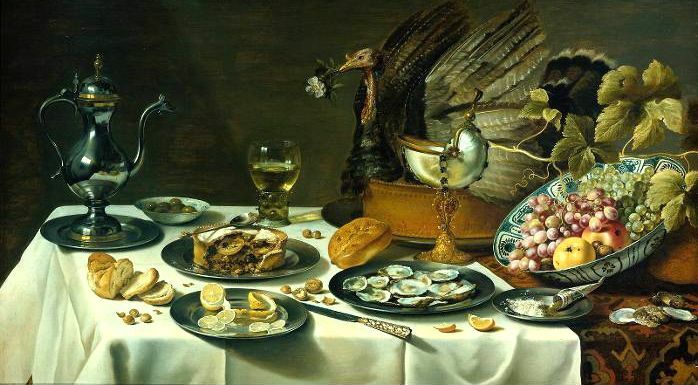 The crust of the large ones was silvered all round and gilt at the top; each contained a whole roe-deer, a gosling, three capons, six chickens, ten pigeons, one young rabbit, and, no doubt to serve as seasoning or stuffing, a minced loin of veal, two pounds of fat, and twenty-six hard-boiled eggs, covered with saffron and flavoured with cloves. For the three following courses there was a roe-deer, a pig, a sturgeon cooked in parsley and vinegar, and covered with powdered ginger; a kid, two goslings, twelve chickens, as many pigeons, six young rabbits, two herons, a leveret, a fat capon stuffed, four chickens covered with yolks of eggs and sprinkled with powder de Duc (spice), a wild boar, some wafers (darioles), and stars; a jelly, part white and part red, representing the crests of the three above mentioned persons; cream with Duc powder, covered with fennel seeds preserved in sugar; a white cream, cheese in slices, and strawberries; and, lastly, plums stewed in rose-water. Besides these four courses, there was a fifth, entirely composed of the prepared wines then in vogue, and of preserves. These consisted of fruits and various sweet pastries. 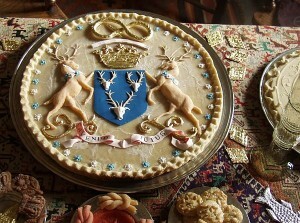 The pastries represented stags and swans, to the necks of which were suspended the arms of the Count of Anjou and those of the two young ladies. This entry was posted in Food & Drink, Tudor Times by admin. Bookmark the permalink.